This strong, attractive, serviceable art table features base construction of selected cedar wood, with a smooth, natural finish. Height adjusts from 31" to 40" and board angle adjusts from 0° to 80°. Drawing board top has smooth natural finish solid core wood grain with vinyl bonded edge. A traditional table for the aspiring artist, crafter, hobbiest. 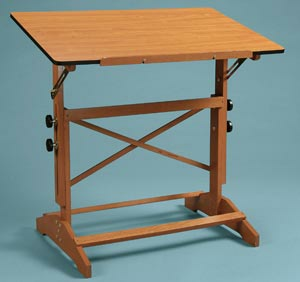 It has Brass hardware and is supplied with 24" adjustable pencil ledge. Shipped knocked-down with easy set-up instructions.